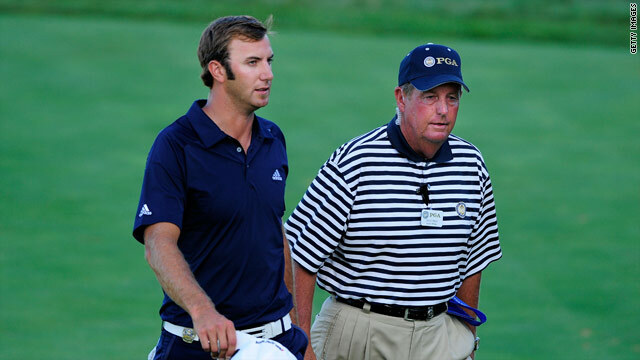 Dustin Johnson walks off on the 18th accompanied by a PGA rules official. The theme of the week at Whistling Straits was the relentless march of golf's young guns as they continue to sweep away the old guard and sure enough 25-year-old Martin Kaymer became the latest major winner. But it was a massive controversy centered on another rising young star, American Dustin Johnson, that will be the abiding memory of this year's PGA Championship. Leading Kaymer and Bubba Watson by a stroke playing the 18th, his tee shot found one of over 1,000 sandy hollows which pit the links-style course in Wisconsin. Surrounded by a mob of fans and marshals, Johnson had little other thought than locating his ball and then finding the green with his second shot because a par-four would be enough to secure his first major title. Unfortunately, the 26-year-old from South Carolina and his caddy should have been a little more careful because unbeknown to them his chances of glory disappeared the minute he grounded his club in the sand. A bogey five - he missed a shortish putt for par - initially left Johnson in a tie with Kaymer and Watson at 11-under, but then came the horrible realization he had made a costly blunder. Local rules at Whistling Straits deem all such sandy areas, however small, as bunkers and it is an automatic two-shot penalty for grounding your club in those circumstances. It is hard not to feel sorry for Johnson, and Kaymer when he spoke with me, was very sympathetic to his plight, also pointing out that it was really just as well he did not make that par putt on the last and then had victory taken away in such circumstances. But all that aside, the rules is the rules, and a copy of the local version had been posted on the noticeboard in the clubhouse for all the players to study. With a $1.35 million prize check for the winner, Ryder Cup places at stake, not to mention a chance to claim a place in golfing history, a few moments spent inwardly digesting such information is the very least one would expect from a top professional and his connections. Particularly on such a quirky course as the Pete-Dye designed layout which posed a series of unusual challenges. Johnson will hopefully learn from this debacle and his U.S. Open last-day meltdown, and re-emerge as part of the new wave of twenty somethings - like Rory McIlroy, Ricky Fowler, Ryo Ishikawa and Jason Day - who are promising to dominate the majors for the foreseeable future. Their message to the faltering Tiger Woods and now 40-year-old Phil Mickelson is crystal clear. We do not fear you and we'll happily knock you off your pedestal. Having said that, it is difficult to imagine the world number one or two making the sort of blunder the youthful Johnson did with victory in his grasp, so perhaps experience does still count for something in golf. I disagree with Patrick's criticism of Dustin. If you actually read the PGA Rules of Golf's (on their website) a clear definition of a "bunker" or "sand trap" is precisely defined and what Johnson hit out of does not meet the PGA's own criterion of a bunker! Moreover, would any other PGA sanctioned event ever allow fans to walk in the bunkers. Putting these two issues together it is evident that the confusion... despite the bathroom mirror notices...was not Dustin's fault. Would we expect PGA touring pros to learn beforehand new rules for "out of bounds", "lateral hazards" or any other penalities for each and every quirky venue they play in? The area included crowd trampled grass. Can grass grow in sand? It would be interesting to know if Pete and Alice Dye (the course designers), the groundskeepers and people who normally play the course considered that spot to be a bunker prior to yesterday or if it is an entirely new addition that was added by the feet of the gallery tramping over it for a few days. I do understand that the posted rules indicated that bunkers outside the ropes would be played as bunkers and Dustin Johnson accepted the ruling with frustrated grace. However, if you look at the course the bunkers on the course even have a completely different type of imported sand than the local sandy soil worn down by the spectators where Dustin Johnson's ball was. If it was intended to be a bunker, it is an entirely different kind of bunker with no resemblance to those within the ropes and no signs indicating that it had ever been maintained as such. If this was a bunker prior to the spectators tramping over it then the ruling sets a very dangerous precedent. I do think Dustin should have been a bit more careful before playing the shot, but the PGA of America needs to be held accountable for such a mickey mouse ruling. There hasn't been one single camera angle that I have seen that shows that that area is a defined bunker. The rule posted at the start of the week was an extremely lazy way to deal with what is essentially a gimmicky course. What is the harm in declaring sandy areas outside the ropes to be waste bunkers? To say that fans and vehicles are allowed to run through a bunker is weak, what's even weaker is saying "play it as it lies" regardless if you are in a footprint, a tire track, or even a sandcastle (yes, there was one young fan that made a castle in one of the bunkers). Yes, it was a blunder, but one that was only too easily made despite the PGA making it known that there were small bunkers all over the course. Personally, I think a lot of the blame should go to the officials, mainly because the gallery was standing in the "bunker" and clearly could have been misread as a worn-out spot on the course where people were gathering. Frankly, if the PGA was aware that this situation could occur, simply posting something in the locker room was not sufficient. Second they let the crowd gather inbounds and on a marked hazard. Therefore, an official should have immediately informed Dustin or his caddy that the ball was actually in a bunker, so I place plenty of blame on the PGA officials. Dustin keep your chin up, you're an awesome golfer and you have a great career ahead of you! ok, so what the hell does "grounding your club" mean? what actually happened? Does it mean that your club touched the ground when you swung at the ball while it was in a sand trap area? That you had a practice swing that affected the sand when the club hit the surrounding sand? what?? I golf, but Ive never heard the term. thanks for the lazy writing CNN. You may have played golf,,maybe, but not much fer sure. That's a term ya should have heard before you ever went on a course. Congrats, you're the only golfer in the world that doesn't know what it means to ground your club. pga officials don't have the guts to blame themselves, for such a ridiculous way of naming every peace of sand a bunker. and then if that was the case , for letting the galleries walk freely on them. The PGA official had a "God complex" and gloried in his moment of power. if you golf? what rules do you play by? what was he offical doing walking off the last green with Dustin anyway, ? why was he interfering at that point , should an offical intervene at all, it is the player who should if in doubt ask an official to come over and give an opinion. if Dustin hadn't ask the opinion then handed in his score card with the wrong score he should have been disqualified. was the official trying to stop this from happening ( and did actually). If it had been Kaymer or Mcillroy would there have been an official volunteering their opinion preventing a mis scored card and thus disqualification,, I dont think so. Nothing less than a horrible design of a golf course......the PGA should never have accepted these sandy areas as bunkers.......but this is unfortunately the American way: they seem to make mess of everything they touch. The British would never have made such an enormous blunder. 1. Neither the caddy nor the player read the hot sheet with the quirks of local playing conditions clearly communicated. You reap what you sow. 4. Grass is green. Sand is not green. Unless you are color-blind, the margins of the bunker were clearly defined. 5. The fans should be allowed in the bunker if the bunker is in the spectator areas, just like the fans are allowed in the rough in spectator areas. The pros don't complain when their errant tee shots land in rough trampled down by the gallery and they shouldn't complain when their errant tee shots find a bunker after being struck into the gallery. 7. DJ finished fifth, but he should have finished much worse. He asked a spectator to block the sunlight filtering through the gallery by placing his shadow over the ball. You can ask him to move; you can ask him to stay; but you can't ask him to cover the ball.